Here's your dose of awesome for the day. We all know how things can go viral on the internet in a matter of minutes and you would think that after seeing things reach millions of people overnight that we would be more careful about what we post on social media. Apparently a recent patron of a Joe's Crab Shack isn't so smart. 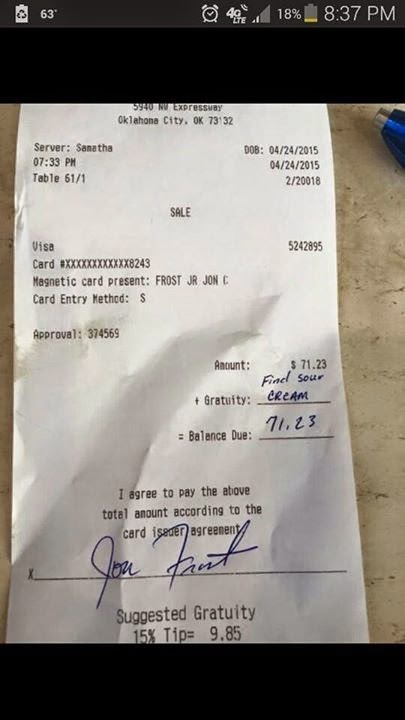 A man who recently visited a Joe's Crab Shack in Oklahoma City, Oklahoma literally bragged online about not tipping his waitress on his last visit, even going so far as to post a picture of his receipt sans tip on his Facebook page. In the photo you can see that the man, instead of leaving a tip, wrote "Find Sour Cream" on the tip line. Many a scumbag patron have been blasted on social media for leaving snarky or downright hateful comments instead of tips. Thankfully, jackassery doesn't seem to run in this guy's family as the patron's cousin, Dustin Clark, refused to let this disrespect go unanswered and unpunished. Dustin took to his own Facebook page where he posted the receipt and publicly shamed his cousin. On his page Dustin said, "I do not believe that that is right. So when I get off work tomorrow I am going to go up to [Joe's Crab Shack] and find this waitress and give her a $20 tip, 10 for the meal and 10 for having to deal with rude people, and apologize for her inconvenience." What makes this story even better is the fact that Dustin actually went through with his promise. In another post on his Facebook page Dustin wrote, "Just left Joes Crabshack and got to meet Samantha (the waitress) and was able to giver her a nice card and her $20 well deserved tip. And she seemed like the nicest person in the world, like one of those super nice waitresses that are nice,bubbly and energetic and makes sure everything is perfect, IDK how anyone could have been so rude to her. She remembered her interaction with the rude people , and was very thankful and appreciative of the tip that we gave her. Since it was dinner rush and she had a few tables we didn't stay very long. I think we made her day." Faith in humanity restored! Having worked in the food industry myself I can empathize with Samantha. Some people are downright hateful to people in the food industry and how they can be like that to a complete stranger who is just trying to make a living is baffling to me. Thankfully we have the internet to punish people like Dustin's cousin and to get behind the people like Samantha. Well done internet, well done.